In 1982 Johns-Manville, a major asbestos manufacturer, declares itself insolvent to avoid paying claims resulting from exposure to its products. A year later, Continental Airlines, one of the top ten carriers in the United States, claims a deficit when the union resists plans to cut labor costs. Later still, oil powerhouse Texaco cries broke rather than pay damages resulting from a courtroom defeat by archrival Pennzoil. Bankruptcy, once a term that sent shudders up a manager's spine, has now become a potent weapon in the corporate arsenal. In his timely and challenging study, Kevin Delaney explores this profound change in our legal landscape, where corporations with billions of dollars in assets employ bankruptcy to achieve specific political and organizational objectives. As a consequence, bankruptcy court is rapidly becoming an arena in which crucial social issues are resolved: How and when will people dying of asbestos poisoning be compensated? Can companies unilaterally break legally negotiated labor contracts? What are the ethical and legal rules of the corporate takeover game? 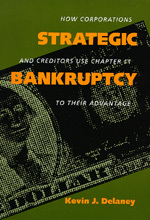 In probing the Chapter 11 bankruptcies of Johns-Manville, Frank Lorenzo's Continental Airlines, and Texaco, Delaney shows not only that bankruptcy is pursued by managers more and more as a strategy, but that it is becoming accepted by the business community as a viable option, and not just a last-ditch solution. This searing exposé of current corporate practices will incite debate among corporate executives, lawyers, legislators, and policy makers. Kevin J. Delaney is Assistant Professor of Sociology at Temple University.